Philip Meyer was the leading pioneer of computer-assisted reporting by applying techniques used in social science research to analyze data and present precise information in easily understood ways. Using computers and statistics software adds depth to reporting and improves its accuracy. Meyer first used the techniques in determining the underlying causes of the 1967 riot in Detroit, which contributed to a Pulitzer Prize for the Detroit Free Press, and later in covering the civil rights and anti-war movements. 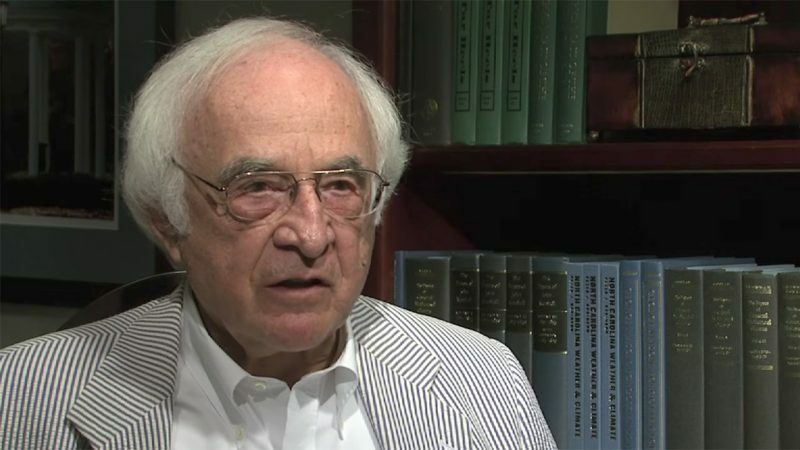 He shared the techniques with future generations of journalists in “Precision Journalism: A Reporter’s Introduction to Social Science Methods.” Meyer went on to become a journalism professor and was inducted into the North Carolina Journalism Hall of Fame in 2008. Philip Meyer, the father of computer-assisted reporting, talks about how the 1967 Detroit riot led to the creation of precision journalism and how it has since evolved. Meyer graduates from Clay County Community High School in Kansas and attends Kansas State University, majoring in technical journalism. He is on the masthead of the Collegian as photo editor and on the Royal Purple staff as a chapter editor. Meyer takes a summer internship with the Clay Center (Kansas) Dispatch. For a minimum wage of 40 cents an hour, his job includes reporting, editing and wrapping papers for mailing. Meyer lands a summer job as a reporter at the Topeka Daily Capital for $50 a week. Meyer becomes editor of Kansas State Collegian his final semester at Kansas State, and a reporter at the Manhattan (Kansas) Mercury. He attributes the sources of his social and political attitudes to George Bernard Shaw, Philip Wylie and Ayn Rand. After serving two years in the U.S. Navy, Meyer joins the Topeka Daily Capital as its assistant state editor. Meyer is hired to be the education writer at the Miami Herald, where he covers Florida’s first court-ordered school desegregation. Meyer is posted to the Knight Newspapers Washington Bureau as correspondent for the Herald’s sister paper, the Akron Beacon Journal. During his 16 years in Washington, he covers the civil rights movement, anti-war demonstrations and presidential campaigns. Meyer wins a Nieman fellowship to Harvard, where he studies quantitative methods in social science. While on loan to the Detroit Free Press, Meyer applies quantitative methods to help discover the underlying causes of rioting in Detroit in 1967. Among other things, he is able to show that people who attended college were just as likely as high school dropouts to have participated in the riot. His use of survey research in covering the rioting is cited in the newspaper staff’s winning of the Pulitzer Prize (Local General Reporting) the following year. The Pulitzer committee singles out the “brilliance of its detailed spot news staff work and its swift and accurate investigation into the underlying causes of the tragedy." The Russell Sage Foundation offers a grant that allows Meyer to produce a manuscript with the working title “The Application of Social and Behavioral Science Research Methods to the Practice of Journalism." The civil rights and anti-war movements of the 1960s and 1970s provide topics for further demonstrating the journalistic application of social science methods. Meyer’s first book, “Precision Journalism: A Reporter’s Introduction to Social Science Methods,” is published by Indiana University Press. Meyer turns his attention to newspaper marketing problems. He runs market research studies and assists in the start-up of Viewtron, an online service, at Knight Ridder headquarters in Miami. Meyer joins the faculty of the School of Journalism and Mass Communication at the University of North Carolina – Chapel Hill as the William Rand Kenan Jr. Professor of Journalism and Mass Communication. Meyer becomes the first Knight Chair in Journalism Professor at UNC, a post he holds until 2008. Meyer writes his sixth book, “The Vanishing Newspaper: Saving Journalism in the Information Age,” published by the University of Missouri Press. It is referenced or favorably reviewed in The New Yorker, The Economist, the Columbia Journalism Review, the American Journalism Review and elsewhere. At the age of 78, Meyer retires as professor emeritus. Meyer’s memoir, “Paper Route: Finding My Way to Precision Journalism,” is published. “Precision Journalism: A Reporter’s Introduction to Social Science Methods.” Bloomington: Indiana University Press, 1973. “To Keep the Republic: Governing the United States in Its Third Century” (with David Olson). New York: McGraw-Hill, 1975. Second edition, retitled “Governing the United States,” 1978. “The Newspaper Survival Book: An Editor’s Guide to Market Research.” Bloomington: Indiana University Press, 1985. “Ethical Journalism: A Guide for Students, Practitioners and Consumers.” New York: Longman, 1987. “Assessing Public Journalism” (editor, with Edmund Lambeth and Esther Thorson). Columbia: University of Missouri Press, 1998. “The Vanishing Newspaper: Saving Journalism in the Information Age.” Columbia: University of Missouri Press, 2004, 2009. “Paper Route: Finding My Way to Precision Journalism.” Bloomington, Ind. : iUniverse, 2012. Charles Lewis interview with Philip Meyer in 2012, North Carolina, 2012.